Housing affordability is a hot-button issue, and as the economy continues to improve, more people are faced with the question of whether they should rent or buy. While single individuals might have more flexibility, parents have far more decisions to weigh. Parents must consider what’s best financially for the family such as, where they can find affordable housing, neighborhood safety, what the school choices are like, as well as ultimately, would it be more financially sound to rent or buy in their current location. When looking to purchase real estate, families should consider the price-to-rent ratio of different locations. This ratio is one of the biggest drivers of how long it takes to break even on a house, and is calculated as the ratio of home prices to annualized rents for a given location. In general, a ratio under 15 means it is more favorable to buy, and over 16 is better to rent. Notably, the price-to-rent ratio doesn’t indicate anything about absolute affordability; it just gives the relative breakdown for a given city between renting and buying. To help families determine where it makes more sense to buy vs. rent and vice versa, the team at Haven Life, an online life insurance agency, wanted to find out which cities in the U.S. have the highest and lowest price-to-rent ratios. 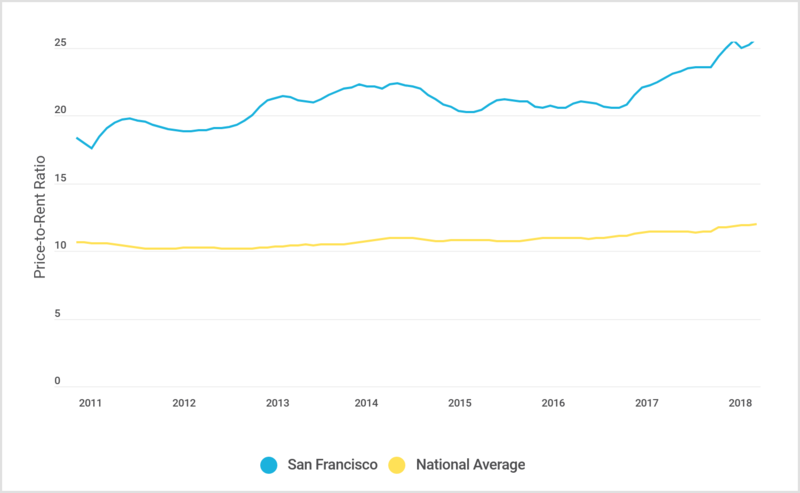 Using the most up-to-date data from Zillow, Haven Life analyzed monthly median price-to-rent ratios, home listing prices, and rents for the 200 most populous cities in the U.S. The team ranked each city by its Q1 2018 price-to-rent ratio, and the results can be seen in the tables below. An overwhelming proportion of cities with the highest price-to-rent ratios are in California—none of which have ratios that are considered to be favorable for buyers. 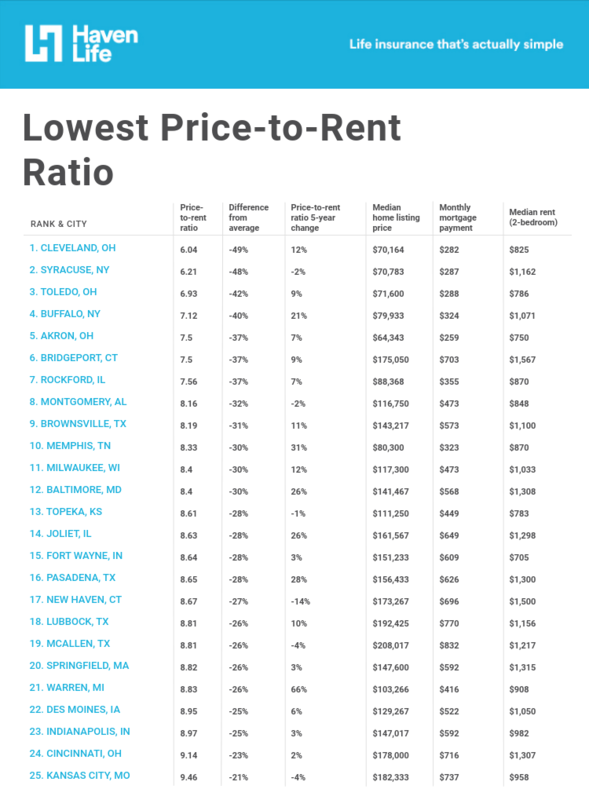 On the other hand, most cities with the lowest price-to-rent ratios are in the South or Midwest. In these cities, buying a home can be much more cost-effective than renting. To increase the geographic diversity, Haven Life also compiled a list of the price-to-rent ratios of the top 25 cities by population and how they compare to the national average. In addition to quantitative values, the list includes other liveability factors to take into consideration when looking to settle in each city. Here are the top 25 cities by population and how their price-to-rent ratios compare. The most populous city in the U.S., New York has a price-to-rent ratio of 24.3 and has some of the country’s highest rents and sale prices. 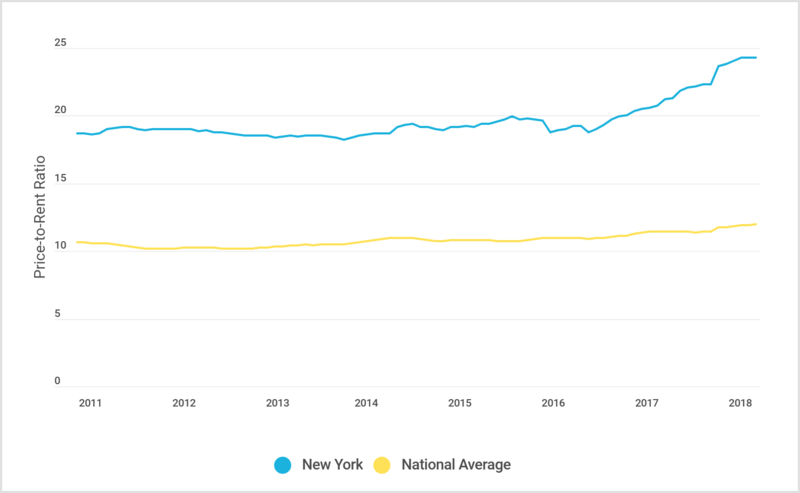 Over the past five years, the price-to-rent ratio in New York has jumped significantly (31%), making the city more of a renter’s market than a buyer’s market. Families looking to move to New York will enjoy the city’s variety of parks, museums, and other educational or culturally enriching attractions. The major downside for families with older children is the complex, highly competitive public school system, which requires incoming high school students to apply to their schools of choice rather than be automatically enrolled in a district based on location. 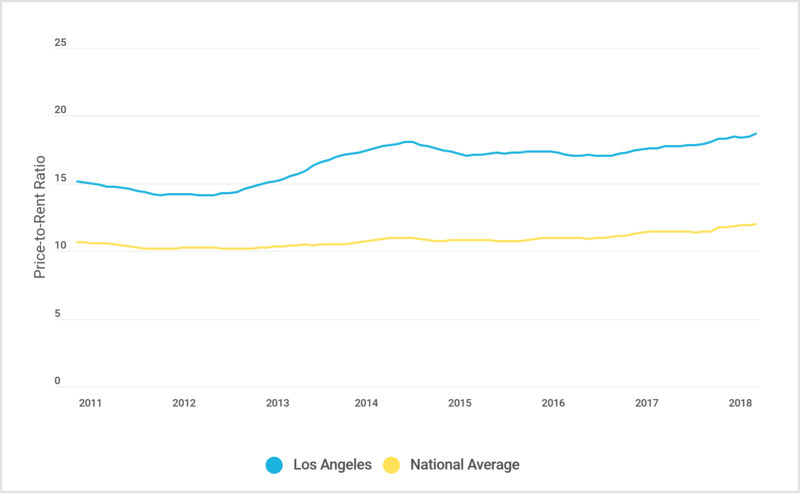 At 18.53, the Los Angeles price-to-rent ratio is 55% higher than the national average. The median home listing price is $768,000, the fourth-highest on this list, and the median rent for a two-bedroom is $3,458, the second-highest on this list. Los Angeles is well-known for its cultural diversity. According to the U.S. Census Bureau, 56.7% of people in Los Angeles County speak a language other than English at home. The third-largest city in the U.S. by population, Chicago has a price-to-rent ratio of 11.33, which is 5% less than the national average. Based on this measure, conditions might be slightly more favorable for buying than renting. The median home listing price is $299,967 and the median rent for a two-bedroom is $1,725. Chicago is also extremely walkable and has a comprehensive public transit system, meaning families can skip the minivan and kids can have greater autonomy in traveling around the city. A sprawling city with comparatively low housing prices, Houston’s price-to-rent ratio of 9.83 is 18% less than the national average. The median home listing price is $326,650 and the median rent is $1,498. 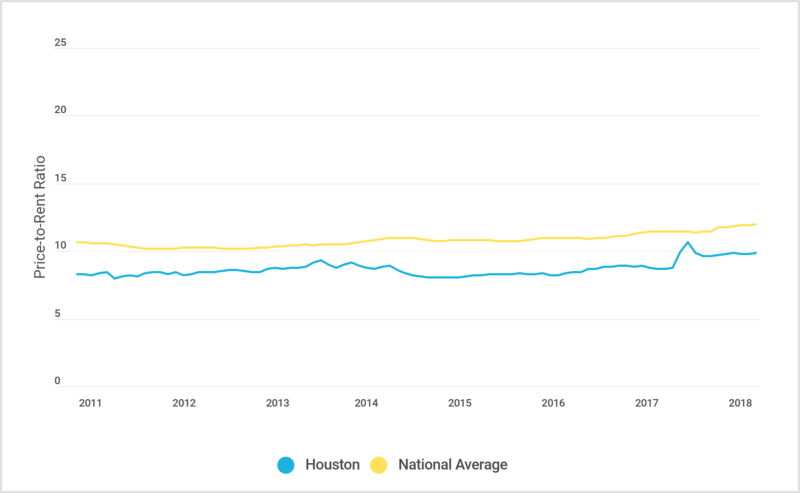 In Houston, homeowners can get more bang for their buck compared to more expensive cities like New York or San Francisco, and the gradually increasing price-to-rent ratio makes now a great time to buy. Houston is known for its young population (median age of 32.7), as well as its linguistic, ethnic, and cultural diversity. Prior to 2012, Phoenix had a price-to-rent ratio lower than the national average. Currently, the 14.33 price-to-rent ratio is 20% higher than the national average. 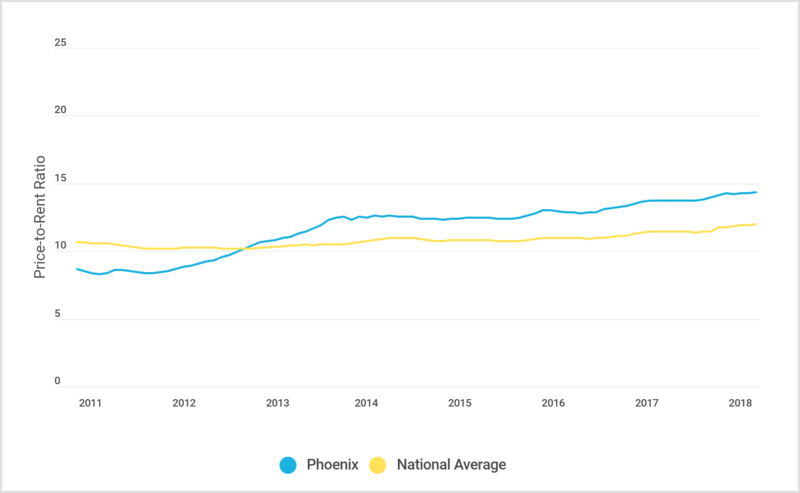 The median home listing price is $273,152 and the median rent is $1,317, making Phoenix a relatively affordable large city. Families will love Phoenix’s year-round sunny weather, earning it the nickname Valley of the Sun, and be tempted to join the state’s 20 million annual tourists in exploring the city’s fine architectural sites and natural beauty. Located only about an hour and a half away from New York City, Philadelphia is significantly cheaper than the nation’s largest metropolis. The median home listing price is $190,967, the median rent is $1,432, and the price-to-rent ratio of 10.40 is 13% less than the national average. 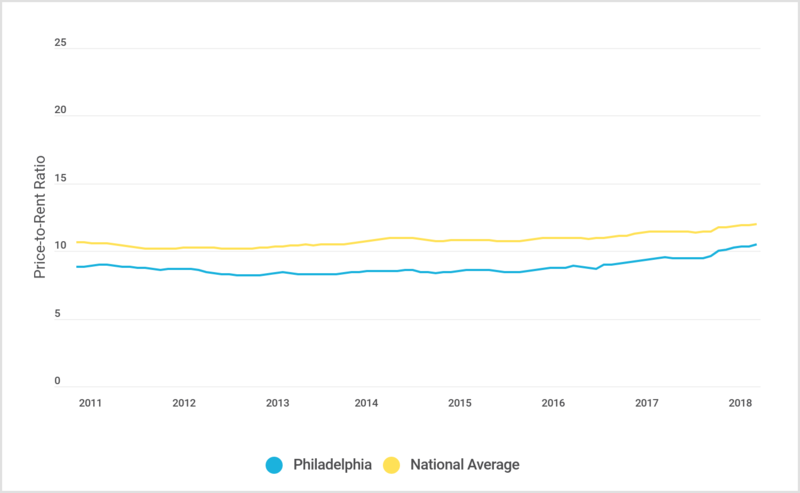 Interestingly, a recent study by Zillow and Care.com indicated that Philadelphia is less expensive than its surrounding suburbs, bucking the usual trend for cities, especially in the Northeast. For families, this means closer access to the city’s arts & entertainment, historical character, and well-established educational institutions at a lower price point. 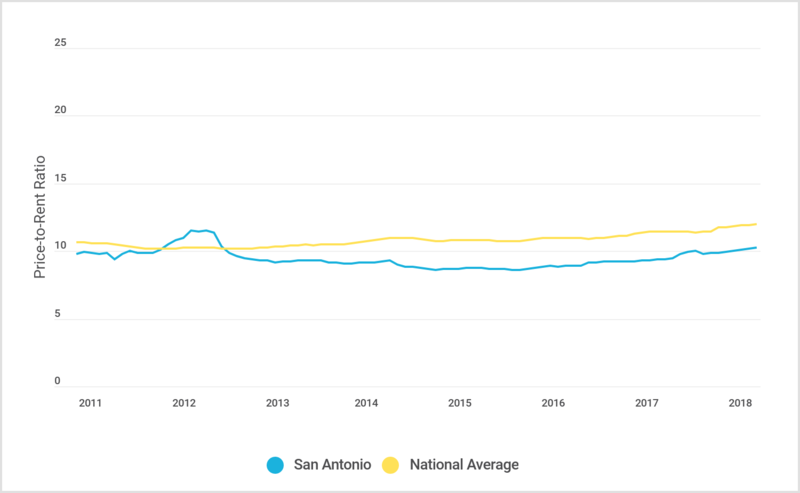 San Antonio’s price-to-rent ratio of 10.17 is 15% lower than the national average, which incentivizes more people to buy rather than rent. The city’s median home listing price is $230,132 and median rent is $1,248. Home to the Alamo, San Antonio is steeped in the history of the American West and Hispanic culture. Spanish is commonly spoken. Continuing the trend of expensive California cities, San Diego’s price-to-rent ratio of 19.35 is 62% higher than the national average. Both the median home listing price ($671,633) and median rent ($2,566) are some of the highest on this list. 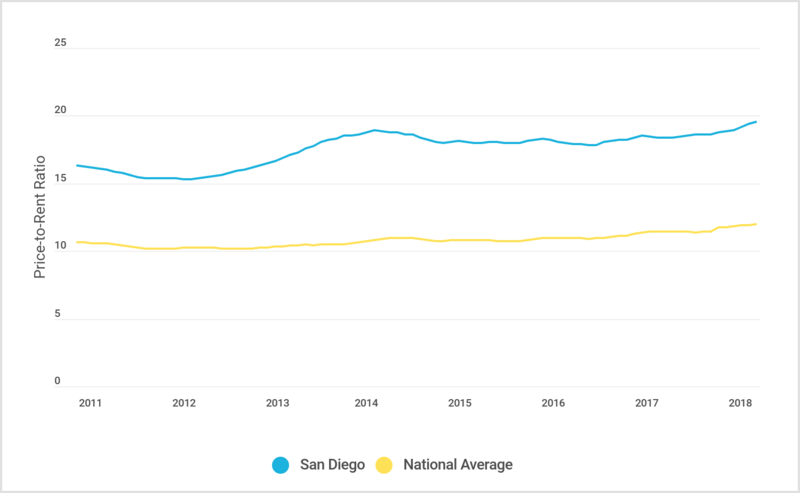 Families should take into consideration that San Diego has a lower crime rate than the national rate, making it highly desirable for raising children. 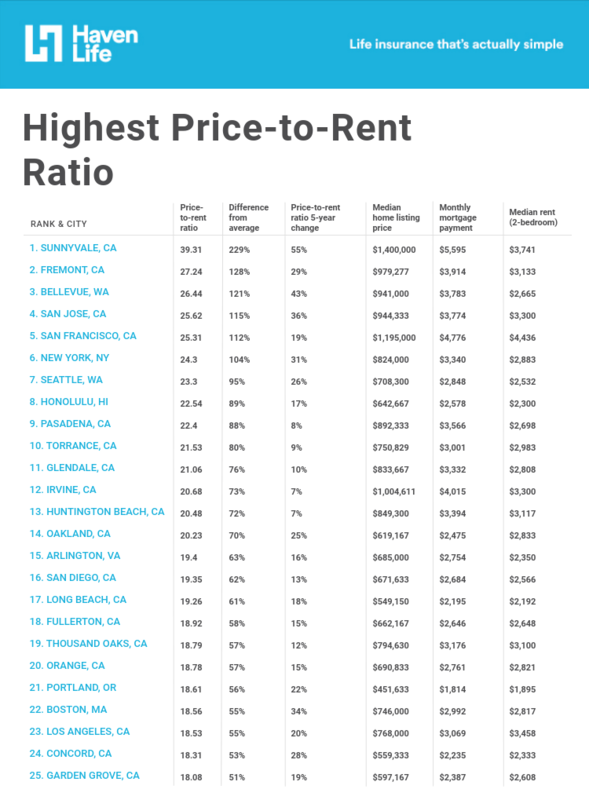 Home to Silicon Valley, San Jose has the highest price-to-rent ratio (25.62) on this list. 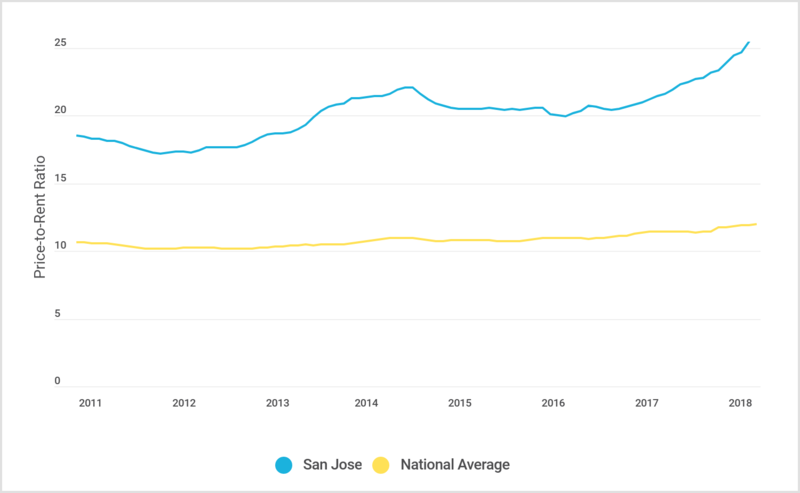 With the growth of tech giants, demand for housing in San Jose has soared and the price-to-rent ratio grew by 36% over the past five years. Even though the $3,300 median rent for a two-bedroom home is second-highest on this list, the high price-to-rent ratio indicates that the market is more favorable to renting than buying right now. Adventurous families will enjoy San Jose’s proximity to beaches and mountains for weekend getaways, but may struggle with its infamous traffic congestion during peak travel times. 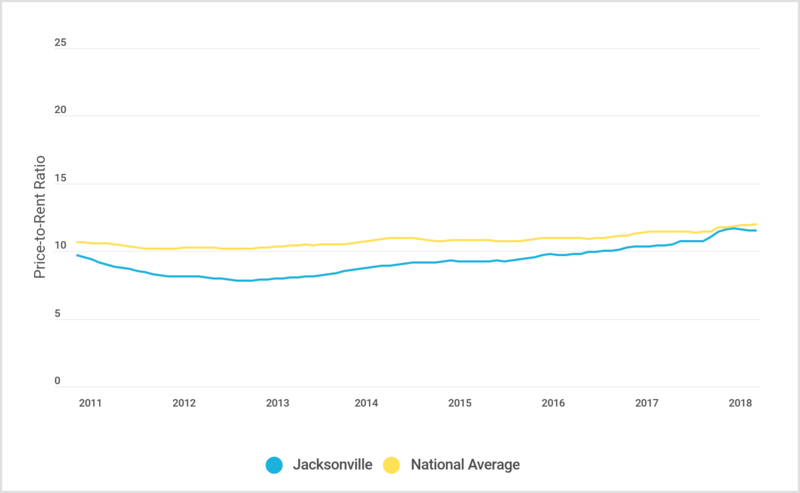 Over the past 5 years, Jacksonville experienced the most dramatic price-to-rent ratio change on this list, increasing by 44% to 11.56. This statistic indicates that although the ratio is still 3% below the national average, it has been steadily catching up and may become more favorable to renters than buyers. Jacksonville is home to the largest urban park system in the country, comprising 110,000 acres, and has gorgeous weather for families to enjoy these amenities year-round. San Francisco has the most expensive housing market on this list, with a median home listing price of $1,195,000 and the median rent for a two-bedroom at $4,436. The price-to-rent ratio of 25.31, the highest on this list, suggests that for now, renting is far more favorable than buying. Families may also want to consider that a 2017 report released by the San Francisco Planning Department stated that only 18% of San Francisco households have children, compared to the nationwide average of 29.4% and a decrease from 18.9% in 1980. 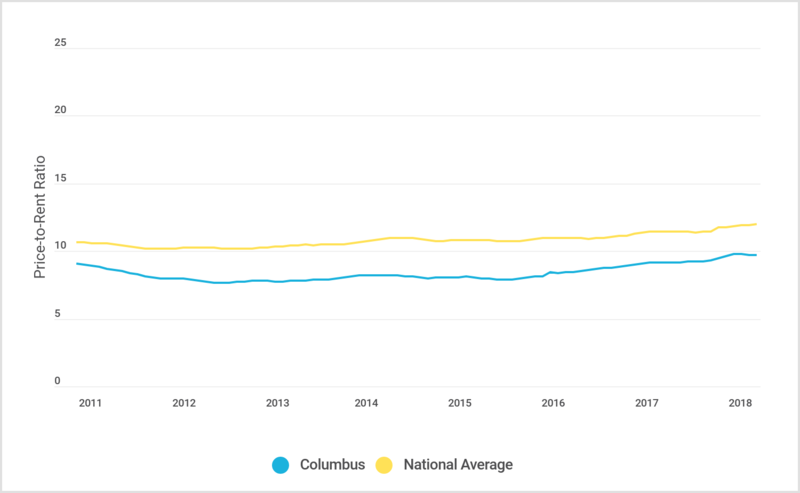 A state capital with a low cost of living, Columbus has a price-to-rent ratio of 9.71, which is 19% less than the national average and extremely favorable for buyers. The median home listing price is $156,250 and the median rent is $1,267, making Columbus one of the least expensive housing markets on this list. With the flagship Ohio State University campus situated in Columbus, the city has a distinctly young vibe and has a significant population of college students, recent graduates, and young families. 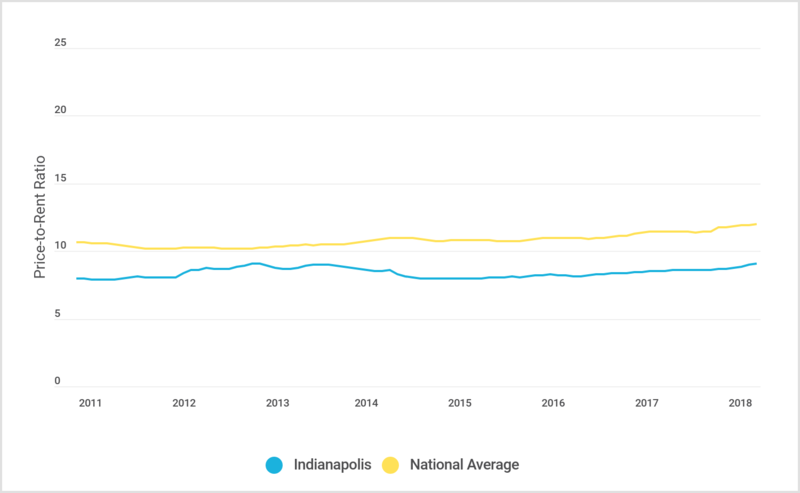 Best known as the home of the Indianapolis 500, Indianapolis has a price-to-rent ratio of 8.97, 25% less than the national average. This number has only changed 3% from five years ago, indicating a largely stable price mix. Housing prices in Indianapolis are the second-lowest on this list, with a median home listing price of $147,017 and a median rent of $982. Aside from trips to NASCAR, families can enjoy one of the city’s 192 parks, or other museums, theaters, and cultural attractions. 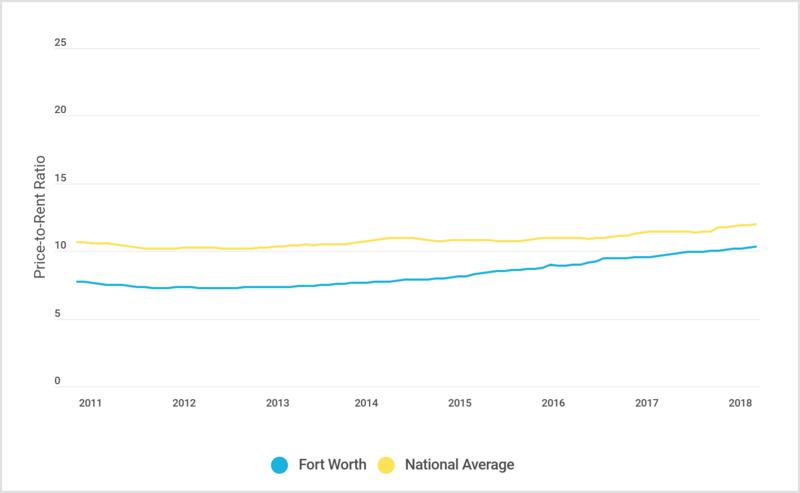 Fort Worth’s price-to-rent ratio has grown rapidly over the past five years, increasing 39% to its current value of 10.25. Nevertheless, this ratio is still 14% below the national average, making a home purchase in Fort Worth a good option—at least for now. Fort Worth has a median home listing price of $243,975 and a median rent of $1,525. Notably, the Dallas-Fort Worth-Arlington region saw a population increase of 146,000 in 2017, the most of any metro area in the U.S., meaning that the city is likely to see significant changes in the coming years. 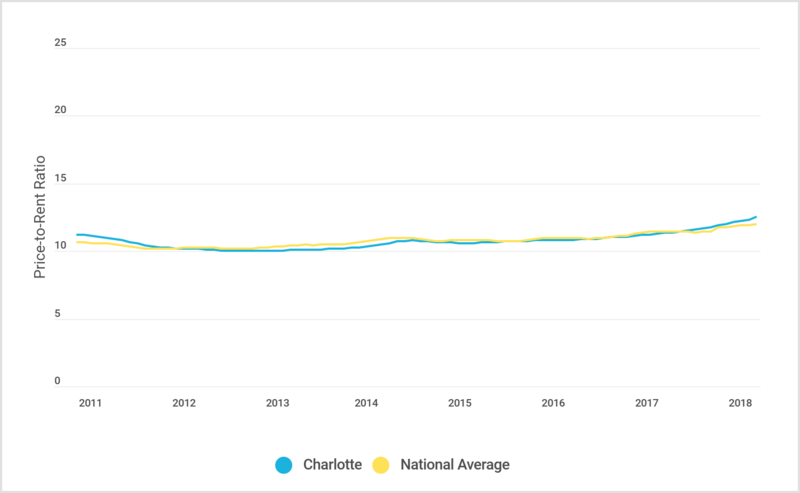 Charlotte’s price-to-rent ratio of 12.34 has closely followed the national average over the past five years and is currently standing at +3%. Compared to the national average, Charlotte’s housing market does not have a marked preference for renters or buyers, but its price-to-rent ratio is in the buyer-friendly range. Charlotte’s reputation as a hub for arts, culture, and professional sports appeals to city-dwellers of all ages. 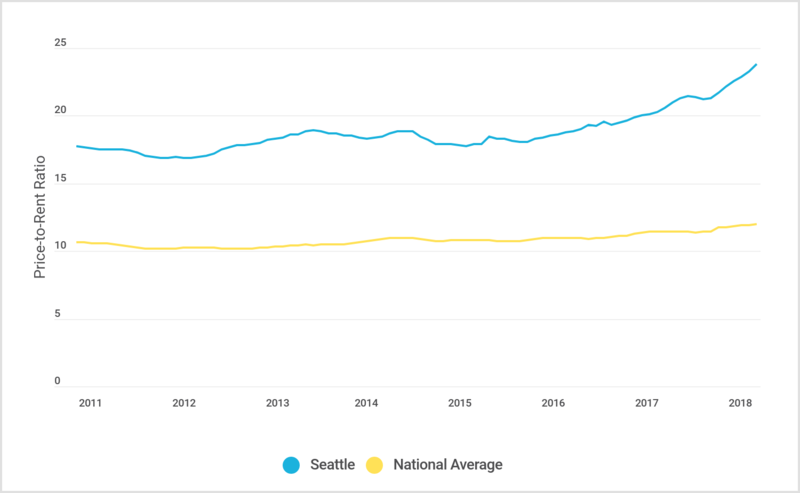 Seattle is one of the largest cities in the Pacific Northwest, and its popularity has soared in recent years driven in large part by employment growth in the technology sector. 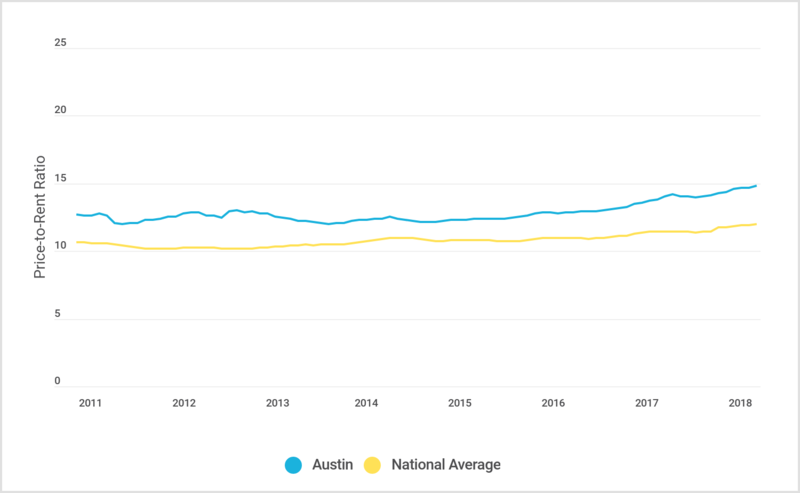 A rapidly expanding population has had an effect on the housing market; the current median home listing price is $708,300 and median rent is $2,532. The price-to-rent ratio of 23.30 is 95% higher than the national average, suggesting a better rental market than buyer’s market. Compared to many of the other cities on this list, Seattle is less ethnically and culturally diverse. 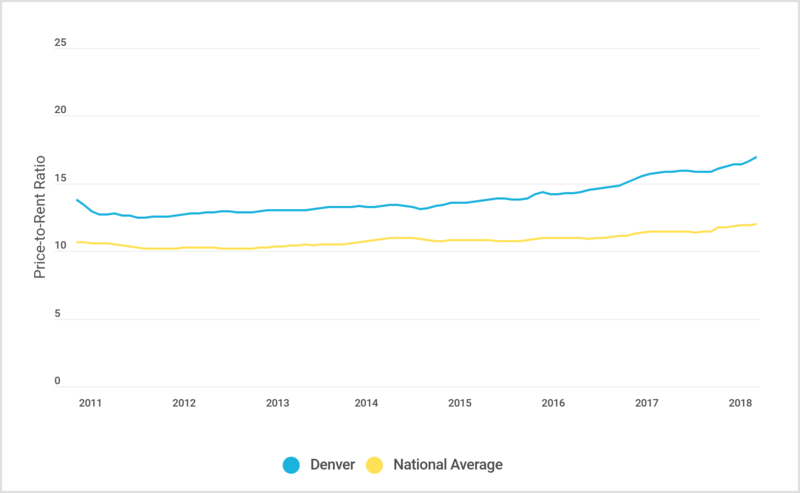 Denver’s price-to-rent ratio has grown 28% over the past five years, standing currently at 16.69. 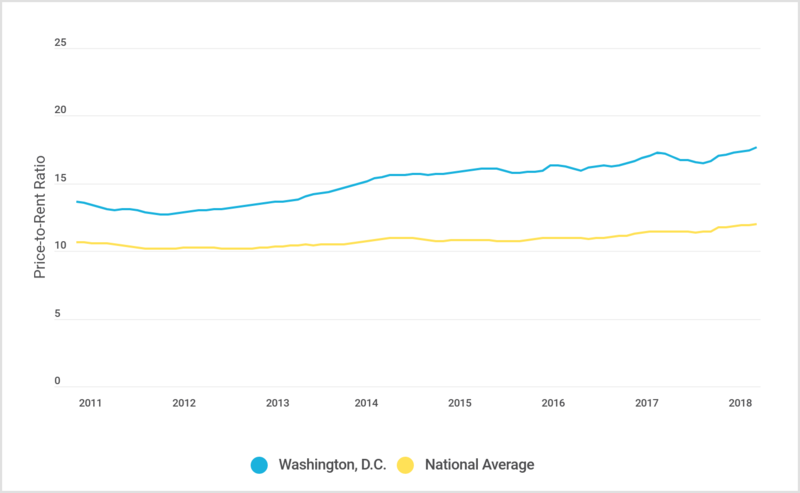 This ratio is 40% higher than the national average, making the $2,065 median rent a slightly better deal than the $478,333 median home listing price. The Mile High City is an ideal choice for families that enjoy outdoor activities because it offers an excellent mix of green space, nature, and urbanity. Another one of the least expensive cities on this list, El Paso has a median home listing price of $164,275 and a median rent of $1,075. 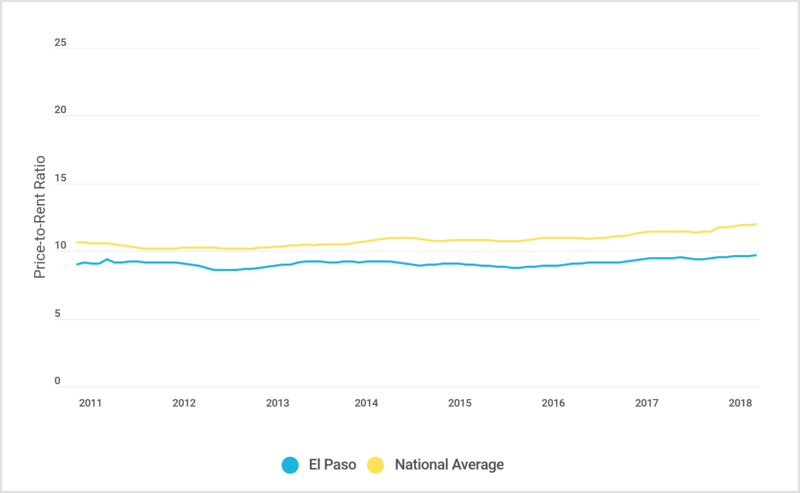 El Paso has a low crime rate for a large city, as well as a multitude of multicultural influences due to its shared border with Mexico. If this description appeals to you and your family, buy, buy, buy—the price-to-rent ratio is 9.65, 19% less than the national average. With so much history at their fingertips, families in D.C. will have no shortage of places to visit and new things to learn, if they can afford to live there. The price-to-rent ratio is 17.50, 47% higher than the national average. The median home listing price is $545,967 and the median rent is $2,517. Families moving to Washington D.C. will want to take a close look at individual neighborhoods when making their decision. The city has a high crime rate, which varies significantly across the city. 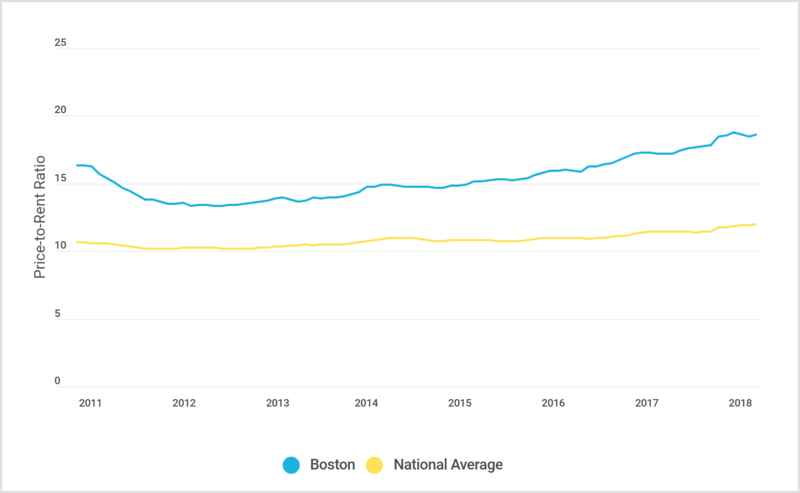 Another expensive city in the Northeast, Boston has a price-to-rent ratio of 18.56, 55% higher than the national average. The median home listing price is $746,000 and the median rent is $2,817. Boston, and Massachusetts in general, is widely acknowledged as having one of the best public education systems in the country, and its plethora of higher education institutions attracts even more young talent. 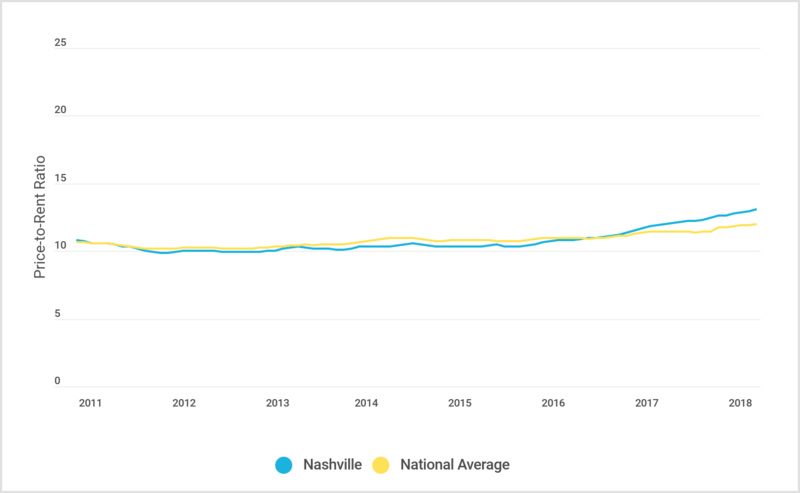 Nashville’s price-to-rent ratio of 12.98 has recently overtaken the national average by 9%. The median home listing price in Nashville is $339,967 and the median rent is $1,600. Nashville is known as a college town and a major hub for country music, but in recent years it has also become known for its professional job market and building boom—all of which show no sign of slowing down. 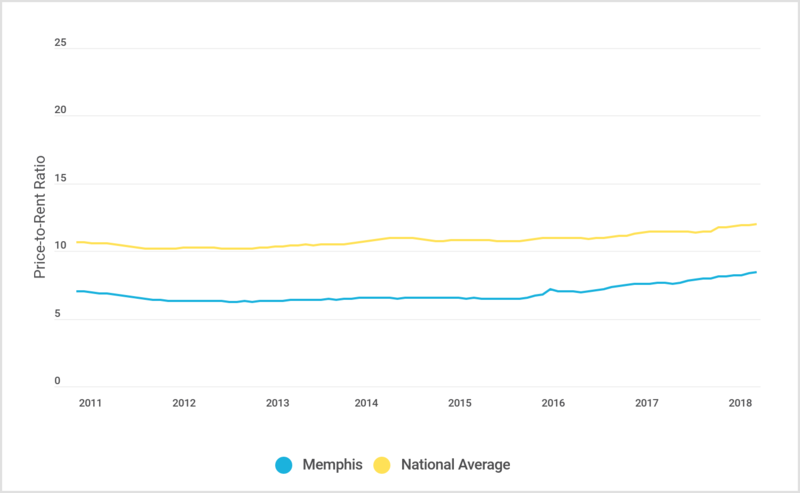 Rent and home prices in Memphis are lower than most other big cities in the U.S., making it a haven for young families. In fact, the median home listing price of $80,300 and the median rent of $870 are the lowest on this list. The price-to-rent ratio of 8.33, also lowest on this list, indicates that buying property in Memphis makes sense for families deciding to live there. Memphis is highly family-friendly: 25.3% of the Memphis population is younger than the age of 18, compared to the national rate of 22.8%. 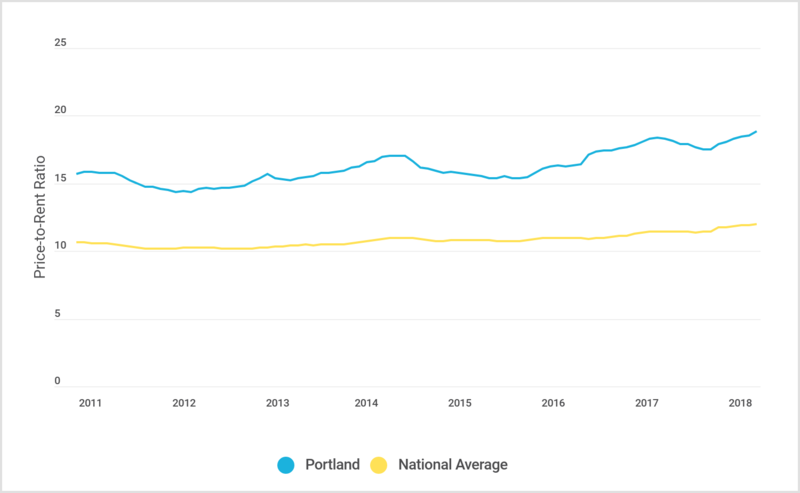 Portland’s price-to-rent ratio is 18.61, 56% higher than the national average and a 22% increase from five years ago. Portland has a median home listing price of $451,633 and a median rent of $1,895. Portland only has 18.4% of the population under the age of 18, lower than the national rate, so there are relatively fewer kids in the city. Oklahoma City has a price-to-rent ratio of 10.17, 15% less than the national average. The ratio has stayed somewhat consistent over the past five years, only increasing by 10% during that time period. The median home listing price is $182,567 and the median rent is $995. 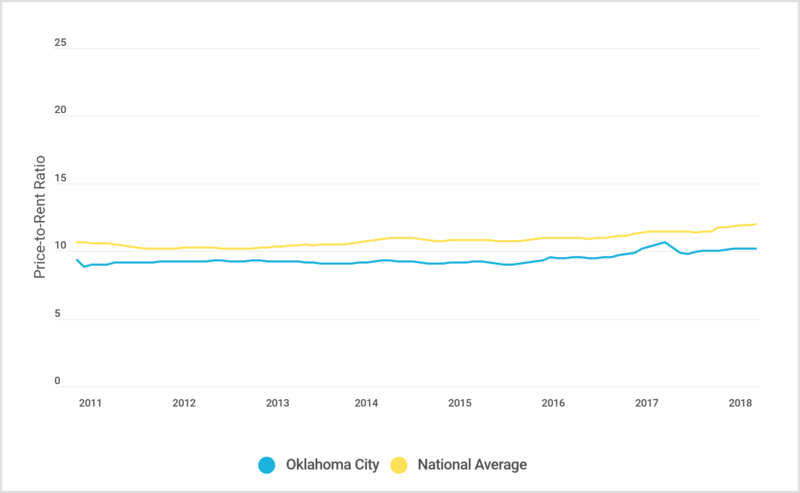 A combination of pleasant weather, a well-regarded education system, and a low cost of living makes Oklahoma City an excellent place to raise a family. 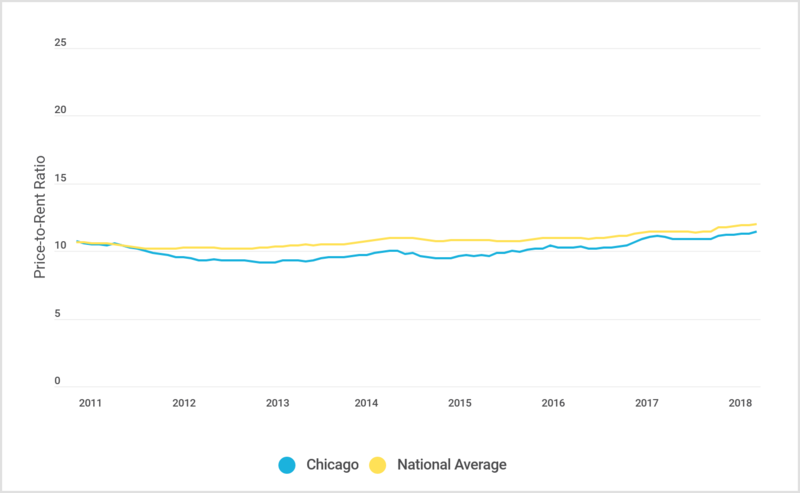 Monthly median price-to-rent ratios, home listing prices, rents, and state-specific mortgage rates were provided by Zillow Group. The Price-to-rent ratio, Median home listing price, and Median rent (2-bedroom) reported in this analysis is for Q1 2018 and was computed as the average of the respective median values for January, February, and March of 2018. The Price-to-rent ratio 5-year change is the percent change from Q1 2013 to Q1 2018. The median price-to-rent ratio in Q1 2018 for the United States was 11.94, which was used as the basis of comparison for the Difference from national average statistic. Approximate monthly mortgage payments were calculated using the median home listing prices and state-specific mortgage rates according to the following formula: [R/(((1 + R)^M) – 1)] x [(1 + R)^M] x L, where R is the monthly interest rate, M is the number of monthly payments, and L is the loan amount. For this calculation we assumed a 30-year fixed mortgage with a 20% down payment. Only the top 200 cities by population according to the U.S. Census Bureau, Annual Estimates of the Resident Population 2016 were included in the analysis. Cities with incomplete data from Zillow Group were also excluded. Cities were ranked by price-to-rent ratio. Generally, lower price-to-rent ratios suggest that a city is more favorable to buying, whereas higher ratios suggest that a city is more favorable to renting.